The Moon remains in Cancer and we’re in a Void-of-Course period until it enters Leo at 12:58 AM EDT on Wednesday. Like yesterday, it’s another oddly intense yet disjointed day where we feel slightly out of sync. Today starts with a Moon/Neptune connection that lowers a hazy shade of nostalgic longing over the proceedings. Dream residue clings to us as we wake but the rude awakening begins at 10:54 AM EDT as the Moon connects with Mars and we have to deal with those people who got up on the wrong side of the bed. It’s like they opened the cage with the Tasmanian Devil inside and now it’s running around trying to take a giant chomp out of everyone. Venus opposes Pluto at 7:08 PM EDT, so here we have the Persephone/Pluto myth in action—we may find ourselves hauled to the underworld while we were out singing tra-la-la among the flowers. Uh oh, it got really intense really fast! This aspect can bring up financial or investment issues and all matters involving shared resources. The “life or death” theme radiates from the heart center. It might be a good idea to start saving for a rainy day, reinforce your ramparts, or revamp your ledgers. Since Venus also moves into a T-square (not only opposite Pluto in Capricorn but square Uranus in Aries), we’re not really sure what’s going to pop out of the relationship jack-in-the-box. Outbursts of jealousy, obsessive behavior and all varieties of rants and rampages are possible—put the goddess of Love, the Lord of the Underworld and a hotheaded wild card together and who knows what’s going to be dragged up to the surface? Think “Jane Eyre”–moodiness on the moors, deep dark mysteries, ungovernable passions–and insanity in the attic. Note for today: Don’t expect others to be mind readers. If you’re pissed off about something, say so. Let it out. Don’t go fuming & fulminating because nobody understands you or sympathizes with what you’re currently feeling. Yeah, they may be ignoring you, but they also may be preoccupied, unobservant by nature, trying to stay out of the emotional tsunami zone, or even smack in the middle of their own crises right now. Later in the day, Saturn heads to its second exact trine with Neptune, part of the current Water Grand Trine involving planets in early degrees of Cancer (Venus is closest right now, but Mercury is within range and Jupiter is heading in that direction.) The Saturn/Neptune connection is more of a “long haul” influence, like the Uranus/Pluto square; it reflects the tenor of the times and is “set off” or stimulated as other planets move in and out of its realm of influence. Today’s message: Temper all actions with compassion. Practice empathy and make responsible changes. Saturn and Neptune aren’t all that comfortable with each other—it’s Bottom Line Businessperson vs. The Space Cadet! But they now have the urge to merge, and Saturn’s practical, methodical nature can help Neptune define its boundaries, while Neptune’s magic touch provides the spark of inspiration behind Saturn’s Master Builder plans. Given today’s aspects, I’d think today would be a wonderful day for those of you who write, film or produce anything that’s dramatic and romantic (romance novels, rom-com films, dungeon-y/dragon-y fare, or stories about doomed relationships). Since the Moon’s void of course, the story line will probably feature obstacles and all manner of hopelessly devoted longing or secret liaisons. Write or sketch it out. That’s one of the best ways to channel today’s energies and you can add a dollop of drama after the Moon enters Leo early tomorrow morning. Both of today’s Symbols seem to relate to the Saturn/Neptune trine discussed above. 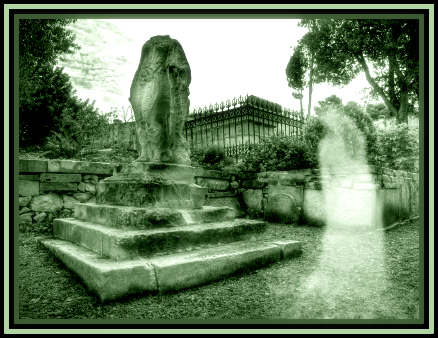 The old (Saturn) man hanging out in a graveyard (even more Saturn) watching spirits rise from a tomb (Neptune) in a spirit of scientific inquiry is one manifestation of this influence. The Sabian Symbol, a labor (hard work = Saturn) demonstration (unity/group consciousness = Neptune) is another permutation this combo can take. In the Kozminsky Symbol, the man is elderly, which can indicate he is wise or has a great deal of experience, emphasizing the Saturn theme, and he also has developed an ability to see spirits (you can’t get more Neptunian than that!). This Symbol relates to the desire to look “behind the veil” to understand the mysteries of the universe. It relates to the mystic, occultist, psychic, spiritualist or medium. The Sabian Symbol is about universal rights and freedom and involves a “group spirit” that seeks progress and opposes oppression and unfairness. The basic impulse towards freedom is a good one, but unless practical action is taken, nothing will happen. So this Symbol relates to a willingness to fight inequality and injustice, to take a stand and sacrifice for the benefit of the group. This Symbol connects with civil rights movements of all kinds and their genesis. Rallies, riots, uprisings, and union meetings all connect to this Symbol. Combining today’s two symbols, it looks like we may hear about some kind of ancient or unresolved grievance (maybe one that people thought was “dead and buried”) that comes up again for review. I was just reading yesterday that women still only make 75 cents on the dollar of what men make. I remember back in the 70s it was something like 64 cents on the dollar, so I’m less than impressed by this “gain”, particularly since many women are the sole earners for their families. The down side of this Symbol is being a rabble-rouser or someone who pretends to speak for the group but who is only it for their own self-aggrandizement or the kick they get from riling people into a frenzy. It also can mean issuing unreasonable demands, obstructionist behavior or being unwilling to negotiate with another party in order to achieve a goal. “Six impossible things before breakfast.” The Lion Heart. Renewed effort. You’ve got the passion and the power, so take a chance. You may find yourself presented with an unusual opportunity. It’ll probably be something you’d normally never try. Don’t shrink from it—accept the challenge. Building stamina, staying the course. This is the Leo Queen, fixed fire. You’re in this for the long haul and you have the strength to go the distance. Biggest problem: Self-undoing, backing off when things get tough, or doubting yourself . Remember to be as loyal to yourself and your ideals as you are to others. Call upon your inner strength. Things will work out if you act from the heart. Thanks, Pattie!! I can’t figure out why you’re not getting notified. If you’re on twitter, click on the right side here where it says follow@laikasputnik57 and then you will get this from my twitter feed. Maybe that will help! !